I had just revealed to my boss that I needed to make a change and I was planning to start looking for other jobs, but his question really caught me off guard. Up until that moment, I had felt one hundred percent confident in my decision. It had taken me several weeks to work up the courage to start that conversation, but it took mere seconds to tear my wall of bravery down. There was a brief moment where I changed my mind and desperately wished that I could take it all back – the phone call, the conversation, my desire to leave. But this was what I needed, even if making the change terrified me. For at least five years it was a fantastic job, a dream job, and right for me in many ways. No matter how much you may love something, it's important to recognize when it's no longer right. Additionally, I felt that I was moving in a different direction professionally. I wanted to pivot my focus toward digital marketing and technology, neither of which are a priority at my company. It was truly the perfect storm of reasons to leave a job, even if the thought of leaving the company I had spent most of my twenties with scared me. Approximately one week after telling my boss that I wanted to leave, I decided to give my two weeks notice. I decided that what I truly needed was a break. While I had already been offered another job, and had been in conversations with two other companies, I really needed some room to breathe. I recently shared why job burnout no longer scares me. I'd be lying if I said that thought of no longer having income after August 8th doesn't freak me out, but I know that this is the right decision. I'm going to spend a week in Massachusetts with my family starting on Wednesday. After that, I'm not entirely sure. My priories are leaving on good terms with my co-workers, finishing as much as my work as possible, and finding a way to share the news with the hundreds of people I've done business with over the past seven years. While I'm not expecting to stay unemployed for long, I'll be sharing my strategies for coping financially during this this transitional time in the coming weeks. I'm confident that brighter times are ahead. Readers: Have you ever been unemployed? 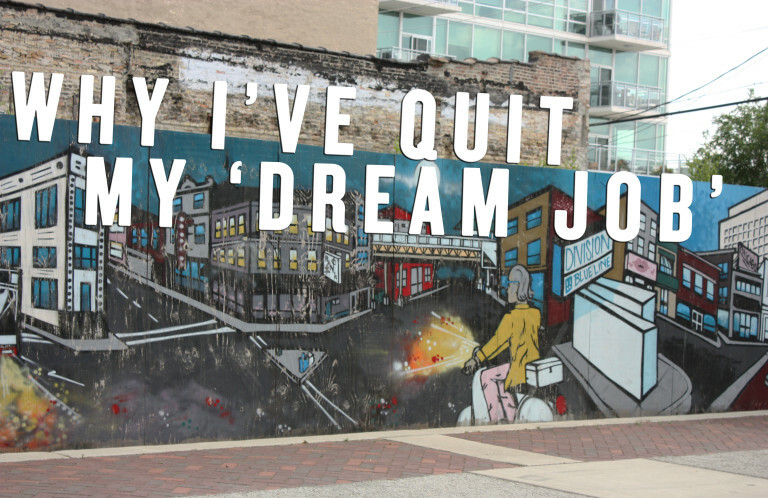 How did you handle the transition between jobs? Wow big decision! I hope everything works our great for you! I left jobs before without having another one, but it was a different time (in the 90’s) where you could always easily get temp work of find another job very quickly. Not sure what it’s like now. Of course I wish you nothing but the best and hope you get some rest and some relaxation! Unemployment has never really freaked me out because it’s part of the reality for actors. Every job we get is only a few months long- if that, so it’s only a matter of time before becoming unemployed once again. I’ve always been optimistic, which it seems you are too, and that’s really all I’ve ever needed. Everything really does work itself out when you are taking smart actions. Thanks for sharing this, Stefanie. That’s a great point. Your positive attitude has undoubtedly helped you through all of these transitions. Congratulations on decided to follow your instincts Addison. That takes courage. I have been where you are. I did the same by actually taking an entire summer off. When I did resume my job search I was quickly offered three positions and I choose the one that was the best fit for me. I never regretted that decision. As a result of taking that initial position and through various opportunities, I transitioned into a new career and being happy with where I am now. Wow, a whole summer off sounds amazing. I haven’t done that since I was thirteen. Thanks for sharing your story. It’s great to hear that everything worked out well for you. Congrats for having the “balls” to make a big leap like this!!! I did something similar with my first job where I told my boss I was leaving without knowing what I was going to do next. He actually took the news surprisingly well and helped me secure my next job in the city where I wanted to move. Leaps like this are scary as all get out but really help you grow in so many unexpected ways. Hahaha, thanks Shannon! In this situation being honest and upfront with my boss was absolutely the best decision. Thanks for sharing your story! Congratulations! It sounds like that although this was a tough choice, it was the right one. What a huge step – congrats again. Personally, I was unemployed after I took the bar exam for about three months. I knew I would get hired, as it is a common in between time for recent law school grads. I can’t imagine being unemployed for long. I always find a way to make money one way or another. Thanks, Natalie. Yes, I’m not expecting to be unemployed for long. First, because I enjoy working. Second, because I like making money. I hope all works out well for you Addison! I only had a brief less than a half year period during college that I was not working. I did not desire to get a job somewhere only to quit in 3-4 months as I expected to have an internship lined up for the winter (and I did get one lined up). Looking back I probably should have tried to get employment during that time, but it was fun and the only time since I turned 16 where I was not working for a period of time (or have something lined up directly afterwards). It made me a bit nervous at first, but it was enjoyable to be able to just spend time on college and with my then Fiance (now wife). Great point, Kipp! It’s definitely important to have a livable job while working toward financial independence. Great reminder. I hope things work out great Addison. I’m glad you assessed your situation and decided it was time for a change. Many people get up every morning going to the same job they hate, just because they did the day before. About 5 years ago, I stayed at an engineering job too long. I loathed it, and it was very unhealthy. You’d never believe how much better I felt when I left. I’ve been unemployed three times, in a 4 year period actually, and it’s never fun……but if you embrace your new possibilities/flexibility it doesn’t have to be bad. Best of luck! Thanks, Bryan. I’m feeling extremely optimistic. Thanks for sharing your journey. Wow! That is something. I haven’t been unemployed in so long I really don’t remember what it is like, so I will just wish you good luck. Me either, Andy. Thanks for the kind words! Wow! You have got guts, girl! I hope you get what you are looking for and that you will find something great. Good luck to you! Thanks, lady! One week later, I’m feeling really good about my decision. Either way, big changes like that are always exciting – so hope your next one is even better, brotha! Thanks, J. I really appreciate the encouragement! It’s an exciting time. Thanks, Ryan! Me too! Once I made the decision to quit, I knew I had to take the plunge. Thanks for the encouragement. Congratulations on making the leap! I’m sure there are good things ahead for you. I think it’s great you’re taking some time to breathe and spending it with family. The few times I’ve chosen to leave jobs, I made sure to have hefty savings just in case. The transition can be a challenging one, but it sounds like things will fall into place for you soon. Best of luck! Thanks for the support, E.M. My family has been majorly supportive of my decision and it’s great to spend a few days in Massachusetts. I’m looking forward to hitting it hard when I get back to Nashville. Wow, that is a big change indeed. Enjoy your break and the time away. I have a feeling you’ll be looking back on this in a few months and will be so glad you had the courage to make the leap. Cheers to new opportunities! Thanks, Autumn! I hope that this is the case. It’ll be nice to feel relaxed and rejuvenated around the holidays instead of complete exhaustion from months of traveling. We are also entering a transitional time as my husband is about to pull the plug on a nightmare job, here’s hoping it works out for all of us eh? Wow, it sounds like big changes are on the horizon for you guys! Best of luck with that. I’ll look forward to reading about it. Thanks for the encouragement, Dan. Transition can be scary, but it’s also good. Sounds like you thought long and hard about this, and it was something that was bothering you. So it’s the right thing to do. Wish you luck. And I hope you get some much-needed R&R in! Thanks, Jason! Your journey has continued to inspire me. Especially with the decisions you’ve made regarding family. Thanks for the support. I’m feeling optimistic. Thanks for sharing your story and the reminder than unemployment can occur at any time for a variety of reasons. It’s important to remember this when building an emergency fund. Thanks so much for the encouragement, Melissa. I really appreciate the support. Best wishes, Addison. I hope that you find something meeting more of what you are looking for. I’m surprised and not surprised, but needless to say it takes a lot of courage or possibly just being really fed up. Thanks for the kind words. Life is too short to continue traveling down the wrong path for too long. I hope the best for you and I know that you made a good decision. My hubs also talked to me that these past few days he doesn’t feel like working, it’s hard for him to go to work every day. He wants to resign, but his boss asked him to stay. Thanks for sharing your story, Kate. I’ve definitely felt a similar loyalty to my company, boss, and co-workers, but ultimately, I had to do what was best for me. I think that you have to trust your gut. There’s a point when you just have to do what’s best for you, take a leap of faith, and move on. I think that being optimistic vs. pessimistic also will also play into how you move forward. What an adventure. Go out there and kick some a@@! Thanks for the support and inspiring words, Michelle! You are totally right! I would recommend this to everyone – save up so you can take a 2 or 3 month sabbatical at least once a decade (whether that’s an unpaid break in your existing job or quitting and taking a break before starting new job). It happened to me once in my 20’s and I’ll never forget it. I was moving abroad due to marriage, so I quit my job in US with 3 months savings. When I arrived in new country, I spent a month job hunting. Found a job where they didn’t expect me to start for 2 months. So I had time off where I could live off my savings knowing a job was lined up at a certain time. My mental attitude starting the new job was incredible – I had so much energy too. The number of people I know that quit a job and start the next day or just after the weekend immediately are missing an opportunity of taking a complete break. Thanks so much for commenting and sharing your story! The mental break will be amazing. I get impressed from you. Not only job family is also important. Whenever you are in problem your company and boss will not come to help you. Your family will help you at difficult condition. So take a time for family. I missed it, but what was your dream job? And how long were you working it? I found my dream job right outta college and lasted for 13 years. But I burned out after about year 10-11.